There is just one classical music article in Saturday's Guardian Review section. It is yet another full page splash about Gustavo Dudamel and the Simón Bolívar Youth Orchestra, and is written by Marshall Marcus. You can guess the tone of the piece when I explain that Marshall Marcus is head of music at London's Southbank Centre. This venue is about to host a residency and five concerts by, yes you guessed it, Gustavo Dudamel and the Simón Bolívar Youth Orchestra. By contrast the centre spread in the same Guardian Review section is an interview with the Greek-born film director Constantin Costa Gavras. The credits of this great director include the multiple Oscar winning 1969 classic Z with its soundtrack by Mikis Theodorakis. The film supplies both my header image and headline, and has featured on the path several times. The interview is by the acclaimed and independent cultural commentator Maya Jaggi and celebrates the release of a new 35mm print of Z to mark the film's fortieth anniversary. Closing minutes of Z with those iconic final credits here. And more songs of freedom here. 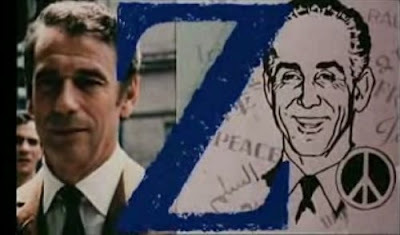 Maya Jaggi's excellent interview with Constantin Costa Gavras gives news of a new 35mm print of Z in the cinemas for the film's fortieth annivewrsary. But I could find no news on Amazon or elsewhere of a new DVD release for the film. Any information on a DVD release of Z would delight me and a number of other readers. If you google 'the mystery site - Z Costa Gravas', there is a review thereon of a DVD of Z issued by Christal Films in 2006, at that time available from Amazon.ca (Canada).